I had a school counselor reach out to me on Instagram (I love how Insta can connect our little worlds!) and ask about advocating for your role. How do you protect your time? How do you let administrators know what your role should be or how you can be used best within your scope? I am lucky to work with a team of counselors who "get it" and an administration that values our role. I'm finishing up my sixth year at the same high school where I have watched our roles evolve in even the short amount of time I've been there. When I first started, we had a lot of duties that were not on the ASCA recommended list of responsibilities. 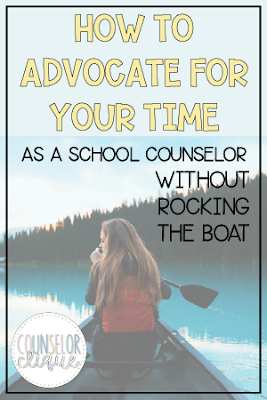 As an encouragement to new school counselors or those who feel like they're just trying to keep their head above water... I haven't always been in a place where I felt as supported as I do now. Here is a list of appropriate versus inappropriate activities from ASCA. I find this very helpful as I think about my role as a school counselor. Everything won't change overnight. As we're nearing the end of the year, now would be a great time to reflect on what went well and what you can work towards changing. Do you get time in front of your principal to talk about things like this? (Principal/counselor relationship post coming later.) I've found that the more my daily activities resemble the list on the left, the more job satisfaction I have. The less resentment I have towards those around me. The more I feel like my position as a high school counselor is valued. I know it's not ALL ABOUT ME, but I am better at my job when I am doing the things my graduate degree actually taught me to do. What data do you have collected from the year? You don't have to be a DATA GURU to start small with this. (Check out a blog post I did a long time ago about this.) Principals LOVE data. Speak their language if you want to see change. Do you collect data about how much direct time you spent with students? If not, set a goal for the start of next year to use your calendar to track these things. Do you collect data about who is walking in your lobby door and if they had an appointment or not? Set up a digital sign in and to figure out if you're spending your days responding to crises! Are you the test coordinator? How much of your time is spent preparing for tests, counting test booklets, and NOT seeing students during that window? If you want things on the "inappropriate activities" list taken away, what will you spend your time doing instead? Do you have new ideas? Would you get in the classrooms more? Would you start an attendance initiative? Would you host a career fair? Would you have more time to apply for RAMP status? What dreams could turn into reality? Have some proposals for new ways to spend your time before you go to your principal to advocate to take things away!